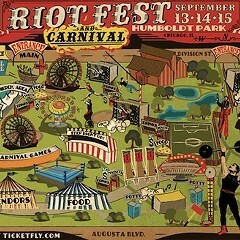 Local punk blowout Riot Fest has steadily grown since it began as a two-day affair at the Congress Theater back in 2005, but it kicked things up a notch last year when it moved into Humboldt Park and transformed into a multistage outdoor carnival, Ferris wheel included. The experiment clearly paid off, as all three days of this year's Riot Fest will take place in Humboldt Park beginning Fri 9/13—last year's festival kicked off at the Congress for one night before moving to the park. It appears the organizers behind the punk happening are intent on making it one of the biggest music festivals in the city, and the initial lineup speaks to that ambition; Fall Out Boy (who play the Riv tonight) and Blink-182, two titans of American pop-punk, headline a bill that includes Violent Femmes, Motorhead, Rancid, Blondie, Public Enemy, Brand New, and plenty of other eye-catching acts. It's a nostalgia-centric event, packed with marquee names from 80s and 90s alternative rock and punk, but if you're going to spend a few days reveling in the bands of yesteryear, Riot Fest has plenty of great options, including the Dismemberment Plan, Rocket From the Crypt, Guided by Voices, and Flag, aka the newly formed group of former Black Flag members Keith Morris, Dez Cadena, Chuck Dukowski, and Bill Stevenson. (Which appears superior to Greg Ginn and Ron Reyes's new iteration of Black Flag.) Nostalgia isn't the biggest problem with this year's Riot Fest bill, though it's not exactly thrilling to see that Peter Hook will basically be doing Joy Division karaoke. Testosterone is, as the number of bands with female members pales in comparison to that of dude bands to such a degree it rivals Lollapalooza's lineup. Riot Fest does have Lollapalooza beat in several noticeable categories, including rap. The number of hip-hop acts is small—there's Atmosphere, Dessa, Saul Williams, and the aforementioned Public Enemy—but strong enough to show that even the bookers of a punk festival have a better understanding of rap's ubiquity than an "alternative" music fests that slots two of few artists representing the genre (Kendrick Lamar and Death Grips) at almost the same time. 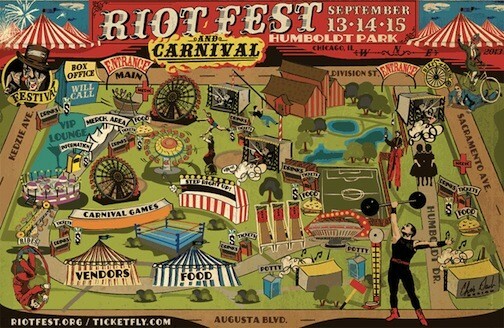 Riot Fest's bill also boasts plenty of locals (White Mystery, Twin Peaks, Lawrence Arms, Maps & Atlases, Smoking Popes, Screaching Weasel, the Broadways), seemingly out-of-place indie acts (Stars, Surfer Blood, Best Coast), heavy-hitting ska bands (the Selecter, Toots & the Maytals), and, um, something for the bros (Sublime With Rome). And let's not forget that the Reader's furry Nostradamus, Gossip Wolf, correctly predicted that Bad Religion and Fall Out Boy would play the blowout! Of course there's still other acts that have yet to be announced, including a third headliner; until then check out the full bill below, with lots of links to related Reader features and write-ups, and if you like what you see buy a ticket from the Riot Fest website.